With summer looming, there are two things on people’s minds–barbeques and bikinis. Barbecues mean burgers and hot dogs and lemonade and sweets. Barbecues also mean French fries. Lots and lots of crispy, crunchy, piping-hot fries piled right next to a burger. Thick or thin, crinkle or curly, any way you slice ‘em French fries can turn a would-be-bikini body into something more attractive in a muumuu…with pants…in the shade. That’s where these beauties come in! 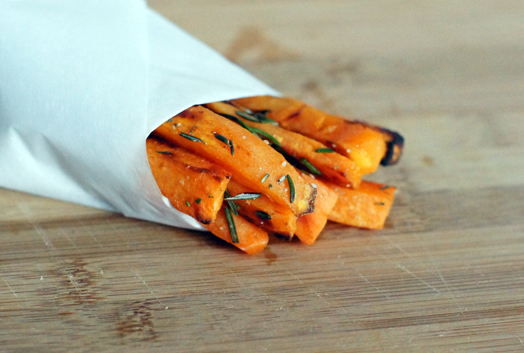 Baked sweet potato fries are a super simple side dish (and healthier too!) fit for any summertime bash. These are dressed up with sea salt and fresh rosemary makes them a little classy, even for the patio out back. Not a fry person? Cube the sweet potatoes instead and top with fried eggs for a delicious breakfast dish. Sprinkle with grill seasoning, curry powder, or even Chinese five spice for a versatile side dish that allows you to eat your fries and wear your bikini too! 1. Preheat oven to 450°F. Line two large baking sheets with parchment paper or aluminum foil and set aside. 2. 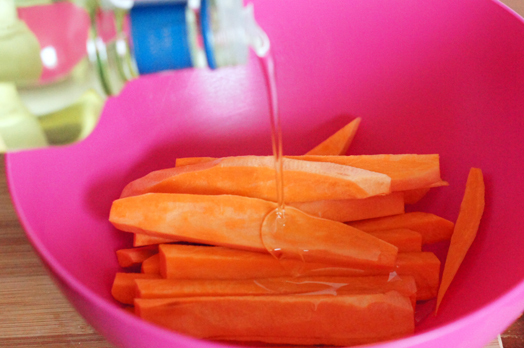 Rinse and peel the sweet potatoes. Cut in half lengthwise and then cut those halves in half. This should give you four relatively flat sections of potatoes to cut into fries. 3. 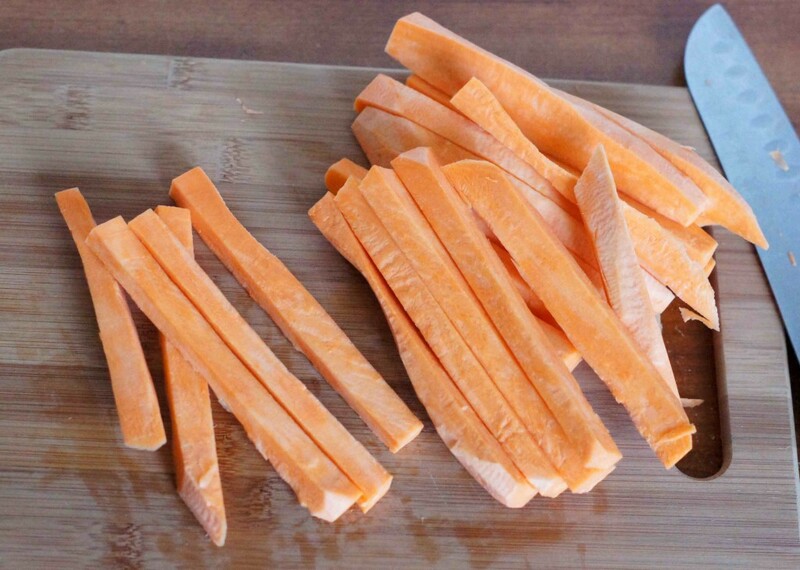 Cut sections lengthwise into fries; thicker for chewier fries or thinner for crispy. 4. Place potatoes in a large bowl and drizzle with enough oil to coat. Toss gently to make sure all pieces are coated. 5. Spread sliced potatoes on prepared baking sheets and sprinkle lightly with salt. 6. Bake in preheated oven for 25 – 35 minutes, turning the fries once after 15 minutes*. 7. While fries bake, remove leaves from rosemary stem and chop coarsely. Set aside. 8. Remove fries from oven to serving plate or bowl. Sprinkle with more salt and chopped rosemary. Enjoy while still warm. *there are different methods for getting a really crispy fry. In addition to slicing the potatoes thin, try soaking in water for 15 – 20 minutes and then drying with a towel before coating with oil and salt and baking as directed. Placing fries on a wire cooling rack while cooking so the air circulates underneath will eliminate the need to turn them 15 minutes into cooking.